In Omega, teachers often incorporate ways to make a lesson come alive. Students embarked on a design challenge of sorts, one in which they challenged themselves, worked against the clock, and figured out how to quickly problem-solve for a solution. Using a piece of paper, tape, and a straw, students were challenged to make a flying object. The idea was to repeat the process three times, except they had less and less time with each round. Students had five minutes. They collaborated in groups and could talk about what sort of rocket they’d like to build. When time was up, they only had one chance to launch and measure how far their paper rocket traveled. Collaborating in groups. Round One. 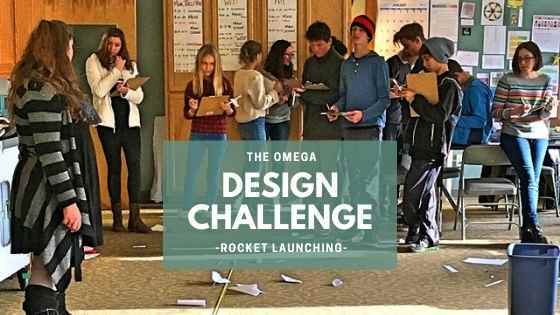 The results for this first round would help inform students as to what trends they spotted, what modifications they might need to make, and what they could do to make their rockets go farther. After all students launched their rockets, the range was from 0 inches all the way to 168″! What’s so incredible is that students were extremely supportive of one another, and they immediately got to work on the second round to make iterations. In essence, they were using failure to inform their next decisions. The next round meant a shorter time: three minutes. Students concentrated furiously and worked to design better rockets. The biggest challenge was not having the amount of time they did on the first round. But, using experiential data, they tried to figure out what would sail through the air the farthest. The results were as varied as the first time! Flight paths ranged from 0″ to 176″! Older rockets were left in place so students could compare and contrast their results. They began to analyze results, as well. All the scores ranged from 0″ to 159.5″. Interestingly, it was the second round where someone got 176″. Perhaps it was the sweet spot between time and thinking to pull off something that would sail farther through the air. Student observations included things like how it seemed like all the rockets formed a bell curve, how longer and narrower rockets seemed to go through the air more easily (though they didn’t always fly the farthest), and that being “smaller” wasn’t necessarily an indicator of how far an object would go. Some students stayed with the same design all three rounds: one student built small paper airplanes and attempted to refine the configuration on each round. Other students modified their rockets based on their observations. Rounds two and three saw more slender rockets. This incredible lesson helps students learn to innovate. By doing so, they’ll come up with ideas for an incredible Design Fair later in the semester.